Alan Marshall came to music relatively late in life. He was 26 when he decided, in 2000, to pursue a career as a singer/songwriter, but a bad decision regarding a management contract meant he was restricted from releasing original material for almost a decade. Originally from Scotland, Alan has been living in Dublin since 2005. He wrote his first song ‘Keep Fighting’ in 2000 and played in cover bands before he was asked to audition for The Complete Stone Roses, a tribute band to the Mancunian legends. They enjoyed great success, touring Ireland and the UK, playing all the big festivals including Wittness and Oxegen in Ireland. However, when Alan, and some of his fellow musicians, decided to leave to form another tribute band, issues arose with their former manager and the resulting court case trundled on for eight years. However, Alan did not fully understand exactly what he was signing. Alan admits he felt bitter and regretful at the time about how his career had effectively stalled, but even though he did not release any new material he continued writing. However, the court action was eventually withdrawn leaving Alan free to reignite his career. In 2012 he independently released his warmly received debut Suilven Heights, a mix of pop, rock, funk and soul. He co-produced it – singing, playing guitar, percussion and string arrangements. The following year Alan worked with Dublin musician Mark O’Sullivan on his album under his moniker ‘Goatboy’. They were friends and Mark asked Alan to play bass and gig with the band, although he said he stayed “longer than I intended” because he enjoyed what Mark was doing although he was itching to get back to his own material. Two years ago he started working with Damien Kellegher, a guitarist from Inchicore. They hit it off and decided to put together a line-up of musicians to play Suilven Heights live and played several “really great” gigs in Dublin. However, Damien tragically passed away at the age of just 41 shortly afterwards. “This was a huge blow to me,” says Alan, who credits Damien with helping him to finally find his groove and Irish folk leanings by introducing him to the work of The Dubliners, Planxty, Luke Kelly and Frank Harte. 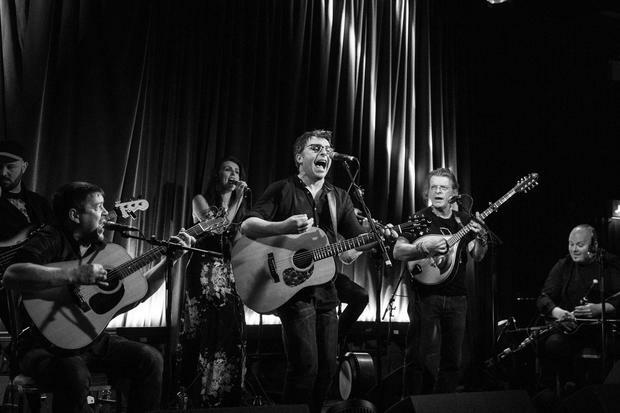 Last year he wrote his second album A Beautiful Brawl, a contemporary take on Irish/Scottish folk music, which launched in May at the Sugar Club, and features musicians of the caliber of Cait O’Riordan (formerly of The Pogues) and Cyril O’Donoghue. Speaking of record deals, Alan is understandably wary of signing a contract given his past experience. “As long as the music keeps selling there’s no real need to have a record label,” he says of releasing material independently. “I love to make music and it would be nice to have someone backing you as it gets hard financially so if somebody was to take a punt I’d consider it. “But I’m too long in the tooth to be changing my image or changing my creative process or style of music or writing. “I see new bands emerging in Dublin all the time and they’re pretty restricted. Their hands are tied. When you look at a lot of music now a lot of it is pretty bland and beige and that reflects how companies treat their artists. They expect artists to behave. See alanmarshall.ie for more info and upcoming gigs.